We’ve got a final, official, floor plan for our house! I’m a big Honda fan, be it my own Super-Civic (the Canada only Acura EL), or the VTEC engine technology they pioneered, or the ailing-but-still-better-than-Toyota’s F1 team they run and their commitment to the planet earth. In fact it’s that commitment I want to draw attention to. 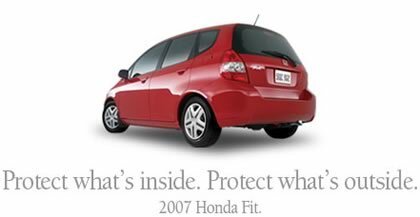 Honda was the first company to have it’s entire fleet of vehicles meet US ultra-low emissions standards and had the first production hybrid with the two-door, two-seat Honda Insight (not the Prius!). Honda makes more engines than any other company in the world, largely do to Honda’s small engine line (generators, lawn mowers, motorbikes and ATVs, etc.) that lead the industry (by far!) in promoting earth-friendly technologies like using four-stroke engines over two. This very earth-conscious (<-- carefully chosen words) company was shut out of Ottawa's recent environmentally friendly car rebate that caps the rebate at cars that use less than 6.5 liters of gas for every 100 kilometres driven. This shuts outs all of Honda's cars except the Civic Hybrid (which uses 4.7 liters/100Km) but most importantly excludes the Honda Fit which uses 6.6 liters/100km. Meanwhile, the Toyota Yaris which uses 6.5L/100km does qualify for the rebate. The Yaris is not a pleasant car, the inside looks & feels cheap, the dash instruments are in the centre of the car and it feels underpowered and and handles clumsily. Contrast this to the fit which has great look & feel, handles and well and feels peppy and amounts to a small car that does not ask for any compromises from the owner – it even costs a little less for similar specifications. In short, the Fit compares best to cars in the 7-9L/100L category, and will hopefully be purchased instead of those cars. [both cars have excellent storage]. Both Honda and Toyota have large investments in Canada, why would the Canadian government privilege one maker over the other? Especially when the government gave no warning of this arbitrary millage figure. Honda tried to dialogue with Finance Minister Jim Flaherty with no success. Honda has now written an open letter to Canadians describing their record, their concern, and their temporary solution. This weekend Lindz and I had our marriage perpetration course in a semi-rural part of Mississauga. It was some nice quality time for me to share with Lindsay and nature. Sunday afternoon while we where leaving my relationship with Lindsay couldn’t have been better, my relationship with nature was at a serious low. Here’s what happened, as best as I can deduce things. A bird had left its droppings on a tree, the tree was no happy with this and decided to get rid of this by secreting a bunch of sap and forcing the bird dropping of the tree and allowed gravity to take its course. Unfortunately the my Acura was beneath that tree for two days. The result was a pool of sap slightly larger than a loonie with chuck of bird dropping in it sitting in the middle of my windsheild. After scrapping this across most of my windshield with my wipers I got home and put more effort into removing this. Spraying and scrubbing with soap did very little. It was a good 15 minutes into the process that I thought of using hot water. 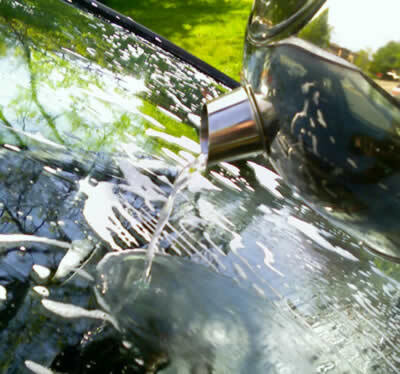 What I did to remove the sap from the windshield was scrub with warm soapy watter while I brought a kettle to a boil and then used the kettle water to finish-off the pre-warmed windshield. I hope my description of this process helps someone out. Tony Blair was at the White-House today meeting with George Bush for one final time before he steps down as British Prime Minister. Bush owes a lot to Blair, as Blair was on-side with the invasion of Iraq ever since he first saw the Iraq Dossier. As such, Bush got him a retirement gift. Tony Blair has seen what’s in the gift, but he cannot disclose its contents at this time. Autoblog.com helped me discover BusSelecta’s customizable car tools. Endless fun. Here’s my two favoutie classic German rides put together on my computer afterwards. You are currently browsing the iMatt :: The Blog of Matt Clare weblog archives for May, 2007 .